1. Melt the butter over a low heat. 2. Crush the biscuits in a polythene bag (using a rolling pin), until they resemble fine crumbs, then add them to the melted butter and stir until the butter is evenly distributed. 3. Put the biscuit and butter mixture into a 20 cm (8 inch) springform cake tin and press it down to form a firm and even base. 1. Pre heat the oven to 240° C.
2. Blend all the filling ingredients (except for the cream), in a large bowl with an electric whisk. 3. Beat the cream in – be careful to not over whisk. 4. Pour the mixture onto the biscuit base. 5. Turn the oven temperature down to 100°C and bake for 90 minutes. 6. After baking, if the cake is a bit ‘wobbly’ when you take it out of the oven, put it back in for another 5 or 10 minutes – until it feels firm on shaking the tin. (Don’t use a knife to check whether it is cooked through – shaking the tin is enough). 7. 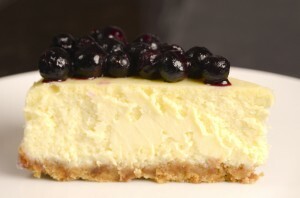 Remove the cheesecake from the oven and leave it to cool down in the tin before chilling it in a fridge for at least 3 hours. Raspberry Coulis – A tangy fresh fruit sauce. Puree the raspberries in a food processor or blender, then gradually add the sugar – taste for sweetness before adding all the sugar – if too sweet add the lemon juice, then pass the puree through a sieve and discard the seeds. (Save a few raspberries for decoration). Warm two tablespoons of golden syrup over a low heat; then take the pan off the heat and add 100g of whole pecans; wait for the mixture to cool down a little bit, then pour it over the refrigerated cheesecake. 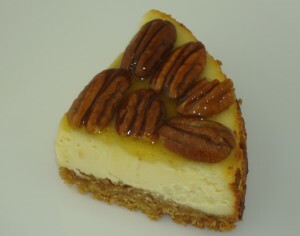 This cheesecake is quite rich and tastes terrific even without a topping; however if you do want to put a topping, fruit glazes, lemon curd, or as in the picture above, pecans in a bit of golden syrup all go well with it. The pecan option has gone down a treat with my children….